If you aren’t yet a fan of Dreams Resorts & Spas on Facebook, then we have a new reason why you should be! Not only do our fans gain access to our latest resort news, photos and promotions, but you can also enter our latest Facebook sweepstakes! We just launched our Mardi Gras Facebook Promotion and will be giving away a free 3-night Unlimited-Luxury® stay at one of our resorts! All you have to do is “like” one of our resorts on Facebook and enter the sweepstakes through the Mardi Gras Sweepstakes tab. The contest will run until April 30th, so be sure to enter and don’t forget to tell your friends to “like” us on Facebook too! Don’t want to wait to win? Then book now with rates starting at $98. Plus receive up to $400 in resort coupons to be redeemed for spa treatments, romantic dinning and more. Book your trip now to save big! This entry was posted in Dreams Resorts & Spas and tagged Facebook contest, facebook promotion, free trip, Mardi Gras Sweepstakes, special savings, win a free vacation. Bookmark the permalink. My boyfriend and I went to Dreams Cancun in august 2011 and we had the time of our lives! I know we would love the chance to come there again and maybe explore the other resorts. 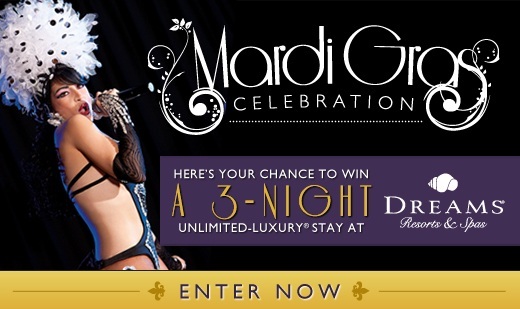 Thanks for sharing this Mardi Gras sweepstakes!